The VB400 bench top vertical optical comparators are versatile measuring systems ideal for the 2D measurements of flexible and flat parts such as plastic, gaskets and sheet metal components. The VB400 optical comparator has a 400 mm diameter screen, you will be able to make large part enlargements using various optional magnification lenses. This is a standard feature for all VB400 optical comparators. 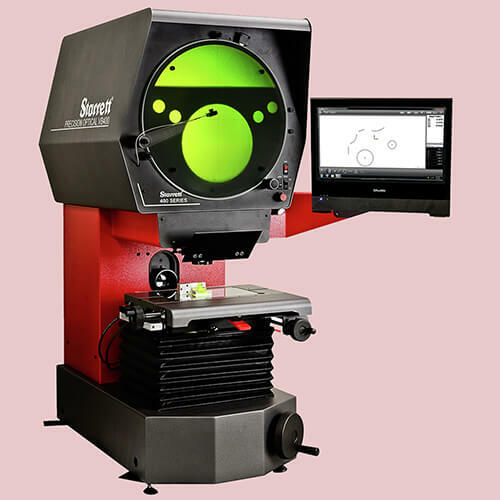 This post will focus on the Starrett VB400 Bench Top Vertical Optical Comparator which has special additional features that makes this product stand out. This optical comparator has a 16” screen, 4” Y-axis and 8” X-axis travel with fine adjustment. It also has a digital protractor which allows this tool to make accurate angle measurements among other outstanding features. Let’s take a closer look at the Starrett VB400 Bench Top Vertical Optical Comparator and the makers of this amazing measurement tool. Founded in 1880 by Laroy S. Starrett, the Starrett Company has grown to become one of the leading manufacturers of gages, saw blades, precision tools and measuring instruments. These products are custom made to fit different industrial applications and they are sold directly to consumers, industrial and professional markets. Starret tools are made with high precision and they are popular with industries that require the use of components with specific measurements. For years, industries like aerospace, military, medicine, metal and machining, technology and many others require precision measurement tools that ensure accurate readings for parts and components. For over 130 years, Starrett has been termed as the world’s greatest toolmakers and their products guarantee durable solutions. Get Starrett VB400 Bench Top Vertical Optical Comparator from Willrich Precision! At Willrich Precision, our catalog carries a comprehensive range of optical comparators, including the Starrett VB400 bench top vertical optical comparator. Our company was founded more than 4 decades ago and over the years we have gained vast knowledge in the field of inspection, gaging and metrology. You can trust us to offer durable solutions when it comes to optical comparators. We understand that buying precision measurement tools can be a hassle especially when looking for specific equipment and that is why we have designed an easy online platform where you can shop easily. Our staff is knowledgeable and experienced staff and is able to guide you through the whole process of purchase. While on our site, you can contact our specialists for more information about our products. You can rest assured that your personal data is safe with us since we have installed state-of-the-art technology. Browse through our inventory for Starrett VB400 Bench Top Vertical Optical Comparator, and buy from Willrich today! This entry was posted in Product Spotlights. Bookmark the permalink. Getting A Retrofit Controller For Your CMM?